There’s something poetic about the fact that multi-state duo, Cloud Caverns, have a two word name that brings to mind both something delicate and airy with something deep and initially full of unknown mysteries because that’s what exploring the band’s music can feel like. New album, Rivers Old and Lost (independent, 2018) is no exception to this unspoken rule. Deciding to unpack and examine music from Cloud Caverns is like staring down an assorted stack of complex literature. Listening from a purely sonic perspective, it’s easy enough to form a solid grasp on the character of sound songwriter and vocalist Brandon Peterson has crafted over the last couple of releases: Collective Memory (independent, 2016), and Holy Gloom (independent, 2016). The musicality has shifted some between those two predecessors and the arrival of Rivers Old and Lost but, the core of Cloud Caverns’ progressive folk and experimental rock spirits remain – albeit adjusted to different ratios of stylistic priority over time – including the transition into today’s release. Looking at this new record from anything beyond sonic roots however, and it becomes obvious the last thing the album deserves is a treatment of “skimming through the assigned summer reading on the bus 45 minutes before the first day of English class.” In short: that can be done but don’t expect to be able to come away with a fully appreciative picture. No, instead, Rivers Old and Lost beckons for thorough and concentrated attention from the very moment one lays eyes on its striking cover art, which is an image of the painting, “St. 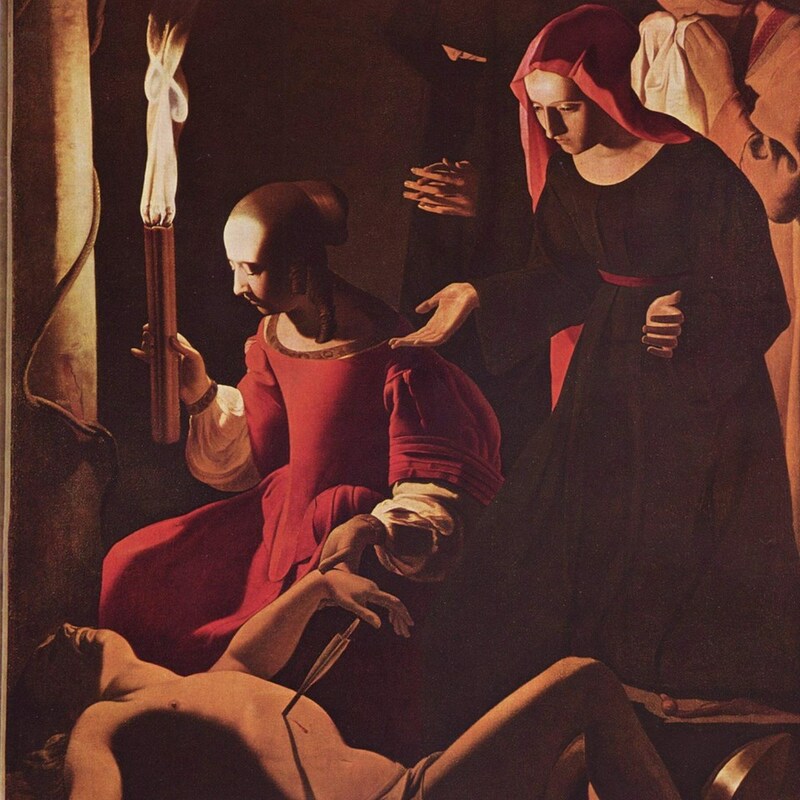 Sebastian Attended by Saint Irene” by Georges de La Tour. Peterson delved back into the worlds of storytelling and visual art through the nine track journey of an album, not entirely unlike the fanciful nature of Holy Gloom but the difference here is in Peterson’s restraint on the use of surreal metaphors or imagery. Peterson explains much of the experiential motivation for the album and in doing so, reveals that personality and intimate thoughts are abound across the album, even if the unaltered color of reality takes more priority over applying the cover of intriguing imagined abandon. The way many of “Rivers’” verses are written shows that more of Collective Memory’s honest but grounded approach to description stands at the lyrical reigns. in a wolf’s den of regression and secession from the things we should progress in? Open that umbrella in the house of God. Let the walls fall, the rain in. In a way, the artistic tone of Rivers Old and Lost feels like a midway point between its two predecessors yet it’s no less engaging for what Peterson is willing to admit to the world and for how he went about doing so with the instruments and know-how on hand. Pluck lines from any song, in any order, and it’s impossible not to be pleasantly shocked at the weight of many barefaced statements and-or want to know what got things to that point in any of Peterson’s recollections – like watching a movie scene that starts you in the middle of a conflict and rewinds backward before rejoining the present. (See the film “Dunkirk,” or the psychologically TV drama, “How to Get Away with Murder.”) Musically, Peterson acknowledging that Rivers Old and Lost “indulge[s his] rock influence and make[s] something a little poppy and a little groovy” is spot on in places. The injection of tonal weight for example, with prominent, layered, and gritty lead guitar hooks like on “The Catacombs of St. Sebastian” or, the major key, upbeat, and more pop-oriented AABB rhyme scheme of “Patriarch Ponds,” help soften the experimental edges of the album, without dulling Cloud Caverns down to the traditional tool box of simply drums, bass, guitar, and keys. Then there are tracks like “Under the Skin,” and the aforementioned “A Day in the Sun,” that feel like hybrids of the topically gripping and the musically friendly. Each tackles subjects leaning toward the frustrated and discouraged side of the emotional spectrum, while weaving melodies that pull in positivity somewhat by default, thanks to their sheer major key chord resolution. This rings particularly true at the misfortune-laden end lines of the latter’s chorus, tugging at the mind’s desire to feel relieved by the cadence and distraught by the narrative (Now we’ve finally found ourselves on some solid ground, solid ground / Just in time for the walls to fall back out). How to begin when I know it’s lost on you? and I’d just love you. Additional listens to Rivers Old and Lost will lead to the unearthing of compositional and orchestral creativity, similar to picking out and admiring carefully placed brush strokes on the centuries’ old painting adorning the record cover. A more poppy approach didn’t translate to less unique writing or production. The ambient wave crash sounds for instance, behind an unplugged rapid guitar strum, on the opening of “Sheepshead (2043)” ushers in a classic wandering folksinger stage reasonably comparable to the impressions drawn from early work by The Tallest Man on Earth; as though Peterson recites his musing on a rocky beach shore near an overlooking lighthouse. Yet, Peterson is also able to steer attention onto his words using more familiar conventions as well, even from the beginning of opening track, “Antechamber,” which is moved forward mainly by a repeated, steady, downbeat thumping of a kick drum; a low octave playing bass; and the soft whack from off-beat snare hits. Melody takes a backseat to an almost recitative style of singing that would make this melodically dark but cautiously optimistic first number right at home in a modern rock scored Broadway show – precisely at the part of the show that is caught between increasing tension and thinking everything is under control. So I’d jot down all those silly old ideas I thought were so profound. In some landfill on the left side of my brain, never seen again. from writing notes to you to singing in a crawl space. And those old songs may be outdated, but their meaning never changes/goes away. And the antechamber’s filling up with hope. And the kingdom is on fire with our love. There are sparks of a rustic quality throughout the finalized mix of Rivers Old and Lost. However, whether or not the mild imperfection of it all is intentional as an artistic statement or merely a reflection and statement of best compiled efforts, the state of the album’s musical affairs as they are, fit with the vacillating state of Peterson’s emotional process from one end of the record to the other. There’s room for adjustment in the mix, just as there is room for change and adjustment in Peterson’s perception of any one of the situations or questions outlined in the songs. It’s common sense to want things in their most sensible, most thought out form but, the best thing about Rivers Old and Lost, and about Cloud Caverns as a whole, is that feeling an ongoing inclination for change pairs seamlessly with the ever changing, ultimately one-way nature of life (one can reflect back but never actually go back), which has become the central thematic building block for the band’s stories over the years. The band’s music is an ongoing saga – like something of a long running, non-fiction book series – that draws ears in and mirrors the unpredictable, mosaic-like quality of marching through the human experience, where something happens, there’s a reaction, and that moment can never be exactly repeated. We just learn to react as close to how we are internally striving for, and hope for the best. And when both the listener and the musician are operating, albeit one before the other, on the same wavelength of not knowing what happens next until it happens and it’s been experienced – not unlike the development of a new historical fiction novel – how can one not want to stay as close as possible to the saga of Cloud Caverns and find out what is yet to come in what’s thus far been an exhilaratingly addictive series of events? Rivers Old and Lost is available now through iTunes, Amazon, and Bandcamp.